After announcing their line-up last week, Lotto Soudal have outlined their goals for the Giro d'Italia. Now that the Spring Classics have come to an end it’s time to look forward to the first Grand Tour of the season. The 99th edition of the Giro d’Italia starts in Apeldoorn. The peloton will stay three days in the South-East of the Netherlands, then it will travel to Italy. After that, the riders wil to compete against each other for another three weeks. Sports director Bart Laysen said: “This year’s Giro starts with a short individual time trial of almost ten kilometres. It will be something for the real specialists. The rider who manages to obtain the pink jersey in the first stage will be able to wear this jersey for about three days without any inconveniences. The next two stages in the Netherlands will most likely end with a bunch sprint. The wind can play an important role but in my opinion, the teams with a decent sprinter will give their all to make sure that these stages end with a sprint. The first week in Italy contains a few interesting stages. Again, there will be some opportunities for the sprinters. But there are also opportunities for a breakaway to survive. Also the GC riders need to be attentive in several stages. The day before the second rest day a long and hard individual time trial is scheduled. Bart Leysen said: “The breakaway specialists will certainly try something during the fourth and eighth stage. These stages have a tough finale so that gives an advantage to the riders who dare to try something. Stage five and seven will offer more opportunities to the sprinters. The sixth stage will be very important for GC, as well as the second individual time trial. The GC riders will have to be attentive at the front of the peloton during the sixth stage, in the time trial they need to limit their loss on their competitors. The riders will need to give their all right after the third rest day with a tough stage that ends with an uphill finish. After that, another sprint stage is scheduled. On stage seventeen a breakaway could be successful again. During the nineteenth and twentieth stage, the positions on GC will be finally determined. The final stage offers a last opportunity to the sprinters. Bart Leysen said: “It will depend on how the riders will have recovered from the final rest day. Some riders feel really good after a rest day, others have very bad legs. The next stage will end with a bunch sprint just as the final stage, although last year that wasn’t the case (Iljo Keisse won the final stage in last year’s Giro d’Italia after a sprint against his co-escapee Luke Durbridge, ed.). We’ll see how many sprinters will still be present in the race at that moment and how the sprint teams will deal with the escapees. It’s possible that a break survives, that’s also the case for the eighteenth stage. "The next two stages will certainly determine the positions on GC. There will be a lot of attempts during these stages. In my opinion, this year’s Giro d’Italia won’t be determined before the final mountain stage. A lot of things can happen during these two days. “We participate with a very strong team in the Giro, several types of riders are part of our line-up so we can play a role in almost every stage. Lars Bak is a very experienced rider and he will be in the sprint train of André during the first two weeks. After that he’ll have a free role so he’ll be able to join a break for instance. "Sean De Bie rides his first Grand Tour ever. It will be another step forward for him. Together with Tim Wellens he’s the youngest rider of our team and they will certainly make each other stronger. Sean will have to do a lot of work, but he’ll also get the opportunity to join a break if that’s possible. The main goal for Sean is to finish his first Grand Tour. 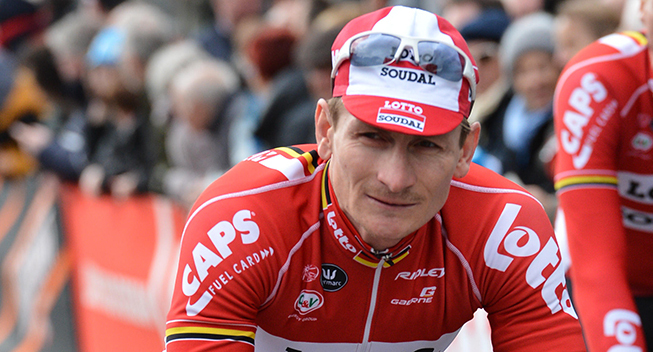 "Of course, André Greipel is our leader to win stages. He completed fewer races compared to last year but I’m sure that André is ready to shine. There will be about five sprint opportunities and he’ll certainly show himself. “Adam Hansen rides his fourteenth consecutive Grand Tour so he knows what such race entails. He will be an important member of Greipel’s sprint train, but just like Lars he’ll also get his opportunities to go for a stage win himself by joining a break. "Pim Ligthart is also a rider who will be part of the sprint train. He will be extra motivated because the first three stages are held in his home country. Pim can also join a break or attack in the finale. "Maxime Monfort will be our leader for the GC. He’ll need to be attentively at the front of the peloton in the important GC stages and he’ll need to limit the time gaps with his competitors in the time trials. Normally, this discipline suits him well. Last year, Monfort was sixteenth overall, this year we aim for the same result. "Jürgen Roelandts will be another important rider for the sprint preparation. His next goal will be the Belgian Championships road race, he needs a long race period so he can improve his shape. Lars Bak, Sean De Bie, André Greipel, Adam Hansen, Pim Ligthart, Maxime Monfort, Jürgen Roelandts, Jelle Vanendert and Tim Wellens.